Home > In Our Stores > Making A Splash With Moon Mermaid! “She was born of the moon and the sea in the blue waters of the Mediterranean Sea. Moon Mermaid first surfaced in 2003 when she began entertaining and performing for humans. Moon is the first swimming mermaid to be spotted in Arizona where she enjoys the warm weather. Moon travels frequently to California, Texas and Nevada. You may have seen her swimming, basking in her mystical 28-foot mermaid lagoon or in her giant seashell at events such as The Phoenix Faerie Festival, Pyrate Daze, The Phoenix Zoo, Stingray Bay, Aquariums, Kids Fair, Talk Like A Pirate Day, at Talking Stick Resort, Insomniac’s Beyond Wonderland, The Phoenix Comicon, Fan Fest, Club Maya, Wet Electric, Big Surf, Paradiso Festival in Washington, the Arizona Renaissance Festival, Two Rivers Renaissance Festival, Medieval Mayhem Renaissance Festival, countless charity events, children’s birthday parties, for celebrities and weddings. Moon not only offers her magical props and mermaid lagoon, she offers the largest traveling mermaid tank in the world at 40ft long and 5,000 gallons.” She is, simply put, AMAZING! Swimming in the ocean can become tiresome. So Moon decided it was time to tell some of the stories and lessons she has learned on both Sea and land. With the help of a fairy and swashbuckling pirates, Moon soon discovered the shiniest treasure of all was “The Treasure of Friendship. Dive into a world of waterfalls, pirate islands, mermaids, fairies, wizards, unicorns and magic! “Moon Mermaid and the Treasure of Friendship” is a beautiful photo storybook about a lonely mermaid that finds a very special treasure map and on her adventure discovers that friendship is the most magical treasure of all! If you missed Moon Mermaid at her Book Launch or at our Sea Filled Summer Kids Event, you can catch her at the Fairmont Scottsdale Princess through Labor Day teaching “Mermaid University“. 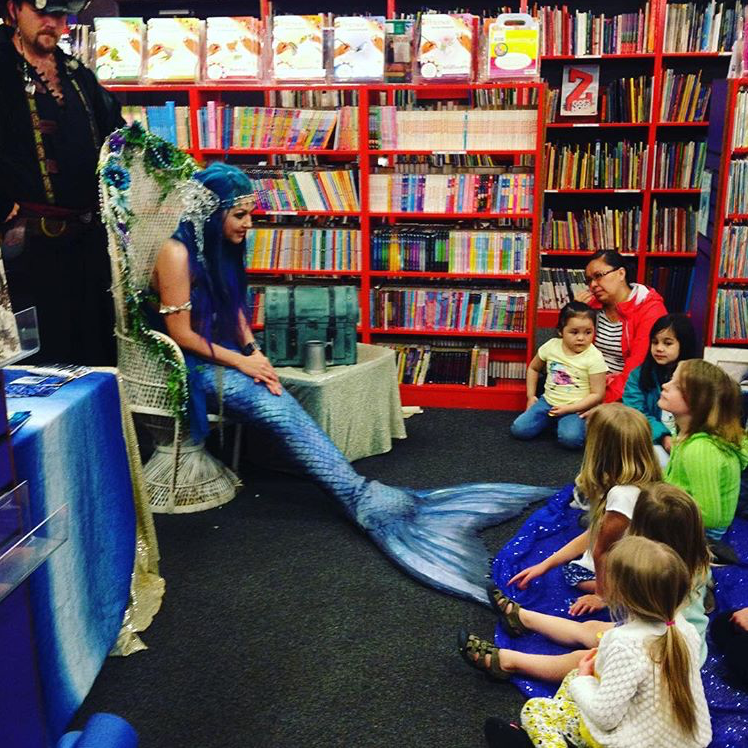 You can also get pointers from her Pirate friends at “Swashbuckler Academy.” Stop by at our Phoenix Location June 30th at 1 P.M. and our Flagstaff location July 8th at 10 :00 A.M for their own Moon Mermaid Summer Kids Events. We hear she is hard at work on her 2nd Book and we can’t wait until she swims into our store again! Check out our Events Page for a complete list of Summer Kids Events. Happening through July at all six Bookmans Locations!